The main benefit to a mesh floor is that Varroa falling from the frames above drop through the metal mesh and meet a chilly end in the grass below. It is thought that up to 20% of hatching Varroa may drop out of the hive this way. All well and good. Varroa floors can also be fitted with a removable slide below the mesh floor. This can be used to count the mite drop on a daily or weekly basis to assess the mite level in the hive and to decide when to treat. Mesh floors also allow the much of the hive debris to drop through so there isn’t that accumulation you see on a solid floor and this helps to inhibit wax moth hell and other hive floor creepy crawlies. Most of the snags with mesh floors relate to the fact that the bees can smell their colony through the mesh. If you move a hive up onto a taller stand, the bees will return to the vacant space where the entrance used to be and then go and hang up under the mesh floor. They will eventually re-orient on the new entrance but when carrying out such manoeuvres – it is best to temporarily put the insert back in or set the hive on a sheet of plywood or similar. A more challenging variation on this theme is when a clipped queen tries unsuccessfully to swarm but then manages to crawl back up the legs of the stand. Gradually most of the bees in the hive follow her and a new colony sets up shop right there under the floor. 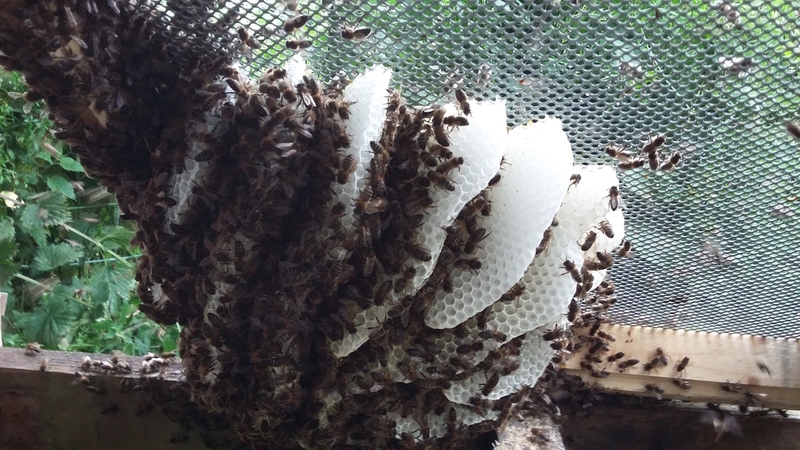 This can also happen when a virgin queen flies out to be mated and on her return she can’t locate the hive entrance; instead she goes under the floor and mooches about under the mesh. 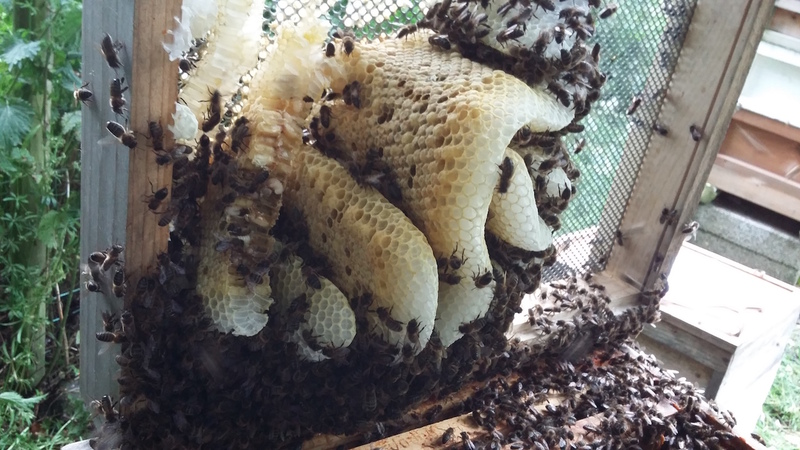 These cases are only resolved by finding the queen and transferring her into the hive. Sadly there was nothing for it but to dismantle the lot, gently shake the bees into the hive and destroy the brood which is more or less a shook swarm and an effective but drastic way of removing a load of Varroa. This case illustrates the unexpected flip side to mesh floors – the heavy level of infestation is due directly to the mesh floor! As the remaining brood in the parent hive above hatched out – with their Varroa (because this is late June and like it or not Varroa levels are high), the Varroa either dropped from the frames through the floor into the lovely, fresh new colony or more likely were drawn down like BIsto Kids by the enticing smell of the brood. Had these bees hung up under a solid floor they would have been mostly Varroa-free. 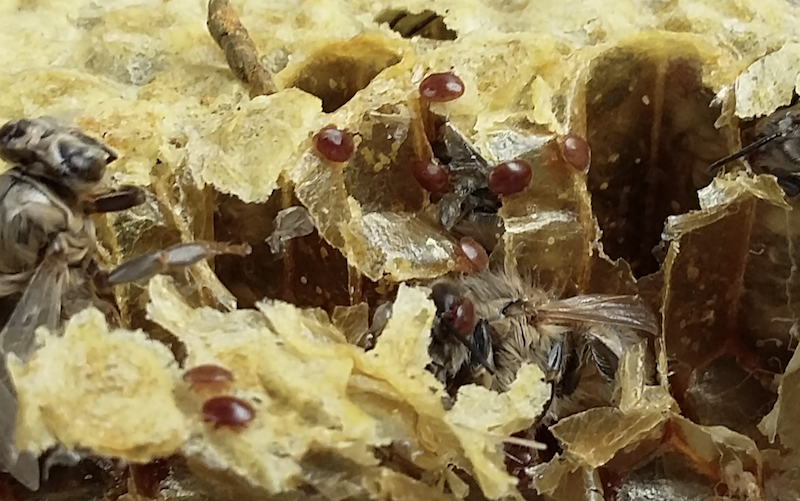 The Varroa would have been marooned above in the empty hive. Mind you – if you had a solid floor they would have been less likely to hang there in the first place. However – it has to be said cases like this are relatively rare and the benefits of mesh floors far outweigh the disadvantages. Sometimes though – it feels like you can’t win.